Don’t let high premiums inhibit your freedom. MyFirstUK can help you find cheap insurance for young drivers through a range of different insurance options. Talk to us about the best methods for your needs. 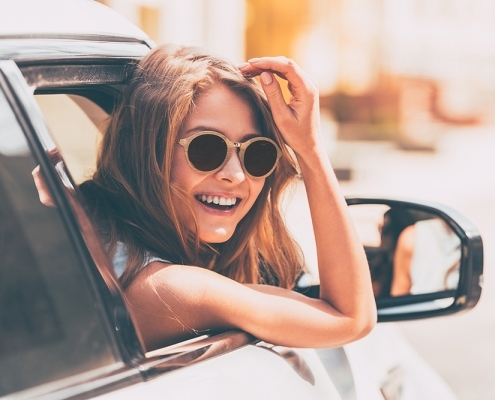 For many young drivers, enjoying the freedom of the open road and the liberating feeling after passing your test is cut short when you discover how expensive car insurance can be. For those who have just passed their driving test and those under 25-years-old, car insurance premiums are high. As car insurance is a legal requirement, young drivers need to do all they can to reduce their premiums. insurance for young drivers. At MyFirstUK, we will search high and low to bring you the best deals and offer all the help we can to help reduce your premiums and make enjoying the freedom of the open road much more affordable. On average, young drivers will have to spend over £1,000 on car insurance. This is because young drivers are considered to have less experience and those between 18 and 24 years old are considered riskier on the roads. This is further evidenced as around 19% of young people have claimed on their insurance within the first couple of years of driving. At MyFirstUK, we want you to be able to enjoy all the benefits that driving can bring. This is why our team of experienced insurance advisors will scour the market to bring you the best deals. We only work with insurers who are pre-approved for their young driver insurance benefits. Third Party – This is the minimum level of cover you can need by law. This coverage will only pay out if you cause damage to other people’s property or need to pay compensation or injury-related costs to other people. Third party insurance does not cover you as the driver; it also won’t cover repairs or replacement of your vehicle. Despite having the lowest coverage, third-party insurance is typically the most expensive as the drivers that usually choose this policy are 18% more likely to crash. Fully Comprehensive – This type of insurance has the highest level of cover. It will cover damage to third party vehicles as well as damage to your own vehicle. It will also cover a high range of causes of damage such as accidents as well as fire and theft. Fully comprehensive insurance used to be the most expensive. However, younger drivers then started to opt for third party and third party fire and theft insurance to get a cheaper deal. As the risk in these categories increased, so did the premiums. Now, fully comprehensive is often the cheapest insurance option available. At MyFirstUK, we can check through all of the insurance options to find the cheapest insurance for young drivers. As each insurer is different, we will review the terms carefully to ensure you are making the right choice for you and your vehicle. Whatever car insurance type you are looking for, MyFirstUK can help. We specialise in finding young and learner drivers the cheapest deals on the market. From using satellite technology and apps to monitor your driving style to limiting the hours you drive, we can uncover a range of money-saving solutions to bring you the best deal on car insurance for young drivers. What’s more, we even offer a range of exclusive finance schemes to suit every budget. Whether you want to cut costs by paying for an annual policy upfront or would prefer smaller manageable monthly payments we can help with your quest to find cheap insurance for young drivers.